Brave Combo’s catalog of recordings range from Japanese pop to Latin American dance tunes, to the orchestral classics to rock and roll at its finest. The band has recorded with the late Tiny Tim, and were the band Talking Head’s David Byrne chose for his wedding reception. From festivals and fairs of all varieties across the globe, rock clubs big and small, colleges, roadhouses, dances, cultural centers (including the annual Midsummer Night’s Swing at Lincoln Center in New York City) Brave Combo has charmed countless listeners and won avid devotees. The band has won two Grammy Awards and been nominated for their work 7 times. 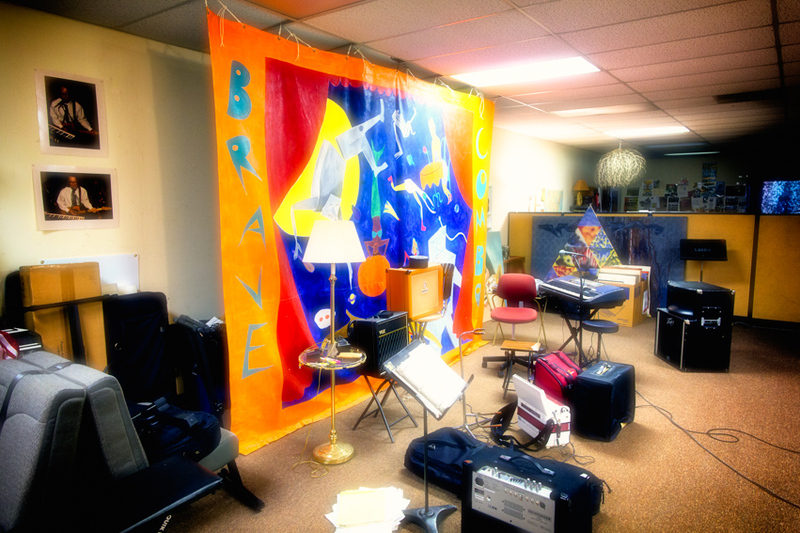 Brave Combo’s office in Denton, TX. Hand painted banner by Emily Lisker. Brave Combo’s vivid music can be heard in the films David Byrne’s True Stories, Clive Barker’s Lord of Illusions, Late Bloomers, Fools Rush In, Envy, The Academy award winning The Personals. They appeared at Oktoberfest in the beloved American burg of Springfield on an episode of “The Simpsons” and in 2008 Brave Combo provided the musical score for PBS’s first ever animated series, “As the Wrench Turns” which resulted in an “Annie” nomination from the International Animated Film Society. Their music has also been featured on ABC’s hit series “Ugly Betty”, and Fox Television’s “Bakersfield P.D.” They have also contributed original music for ESPN and The Big Ten network.